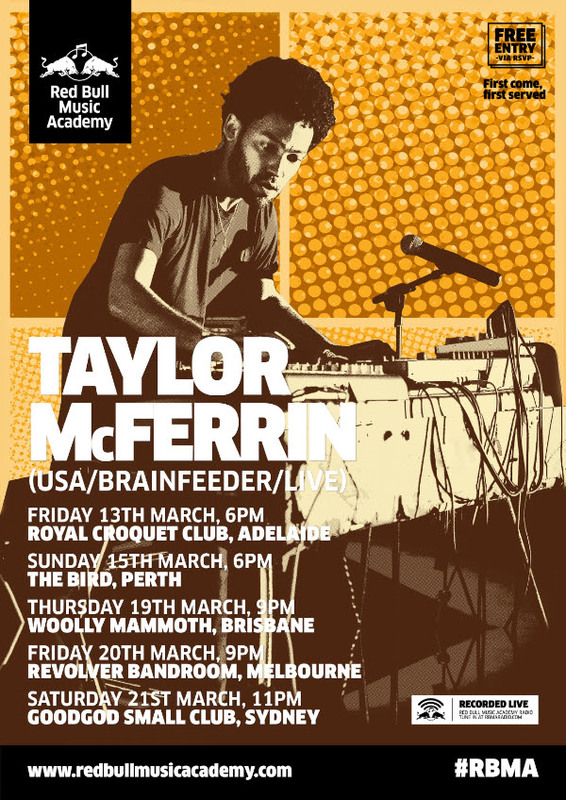 Taylor Mcferrin (USA, Brainfeeder, Live) heads to Sydney for Redbull Music. | SOUL OF SYDNEY FEEL-GOOD FUNK SOUL DISCO vibes & beyond. Taylor Mcferrin (USA, Brainfeeder, Live) heads to Sydney for Redbull Music. Taylor McFerrin (Brainfeeder Records) heads to Sydney’s Good God Small Club to play a show for Red Bull Music Australia as part of his Australian Tour. After releasing his critically acclaimed debut album “Early Riser” on Flying Lotus’ label Brainfeeder last year, and following a whirlwind visit to Australia in late 2014 for the inaugural Red Bull Music Academy x Boiler Room Chronicles broadcast, Taylor McFerrinreturns to our fine island in March for a five-date national club tour, the next installment of the Red Bull Music Academy Club Night Series. With Pitchfork describing the aforementioned LP as “Undeniable beauty” and The Times deeming it as “A sliver of intricate, sun-dappled, jazz-soaked electronica” – expect to be blown away by the multi-instrumentalist that not only stole the hearts of Australia’s own Hiatus Kaiyote, but has been praised by the likes of Prince, Pharrell Williams, Erykah Badu, Ahmir “?uestlove” Thompson, Common, DJ Jazzy Jeff. Those who witnessed Taylor take the stage at last year’s event will know something special is in store – he will be delighting crowds with a solo execution of his much-praised debut album “Early Riser”, in a series of performances that are sure to go down in Red Bull Music Academy history. Influenced by a myriad of musical styles, this genre-defying producer blends anything from 60/70s soul, to modern era hip-hop, free form jazz and electronic music. In his solo live performances, McFerrin has found a sound that seamlessly bridges musical worlds, creating something that is instantly identifiable and entirely unique to the Brooklyn-based producer. Since creating a major buzz with his first EP, “Broken Vibes”, McFerrin has toured worldwide as a one-man show and has played major festivals such as Lollapalooza, Glastonbury, The Big Chill, and Gilles Peterson’s Worldwide Festival. In his home base of New York City, he has performed at legendary venues like The Apollo, The Blue Note, Radio City Music Hall and The Lincoln Jazz Center opening up for artists such as Erykah Badu, The Roots, Nas, Talib Kweli and Robert Glasper. In addition to producing and performing, Taylor has served as the head Instructor of the pioneering Beat Rockers program over the past 4 years, teaching beatboxing and musical self-expression to students who are blind and/or have multiple disabilities at the Lavelle School for the Blind in the Bronx. A deep-rooted, unparalleled passion for creating and sharing music is a trait that is certainly conveyed in his music. 2015 has seen the national Red Bull Music Academy Club Night Series go from strength to strength, delivering England-via-Berlin musical virtuoso Clark’s full-capacity tour, followed by Stones Throw label stalwart, Madlib DJ and all-round hip hop legend J ROCCpacking out the February edition. Adding to a growing list of legendary club events, get ready to embrace the ultimate definition of heartfelt soul with production genius Taylor McFerrin. This entry was posted in Beats, Live, red bull music, sydney, Taylor Mcferrin. Bookmark the permalink.